It may be 5 years since Niagara Falls NY Kart Racer Eric Veihdeffer has been in competition Tuesday Nights but September 4th he made a successful return in winning the Wilder Racing Engines Senior Fun Division 20 lap Feature. In other Performance Manufacturing Divisional Action … Jaedon Lawson of Virgil and two Niagara Falls racers – Nigel Pendykoski and Travis Majuery both won their feature events and were crowned 25th Anniversary Champions in the Superior PetroFuels Junior Restricted, RCM Racing Equipment Junior 2 and Southern Ontario Modified Lite Racing Association Senior Animal Divisions respectively. 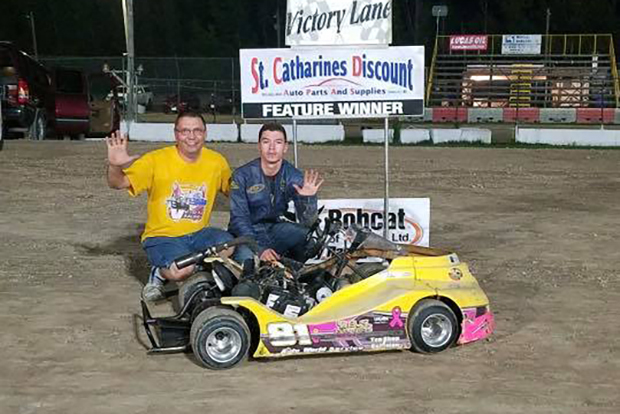 Pendykoski and Lawson would visit St. Catharines Discount Auto Parts Victory Lane on 9 occasions each while Majuery took home 8 checkered flags in 14 Bobcat of Hamilton Weekly Racing Series Events. RCM Racing Equipment Performance Manufacturing Junior 2 Division – 8 laps – Heat 1 Trevor Evans, Hana Rothwell, Nigel Pendykoski, Chris Crowe, Owen Kaiser, Ben Colavecchia, Madelyn Goulding, Cohen Corbett. Heat 2 Chris Crowe, Nigel Pendykoski, Hana Rothwell, Owen Kaiser, Cohen Corbett, Ben Colavecchia. Trevor Evans, Madelyn Goulding. Superior PetroFuels Performance Manufacturing Junior Restricted Division – 8 laps – Heat 1 – Jaedon Lawson, Jacob Mamo, Colton Lane, Austin Nigh, Amber White, Davis Grocott, Logan Iliffe, Lukas Moote. Heat 2 – Austin Nigh, Davis Grocott, Jaedon Lawson, Jacob Mamo, Colton Lane, Logan Iliffe, Lukas Moote, Amber White. Wilder Racing Engines Performance Manufacturing Senior Fun Division – 10 laps – Heat 1 – Eric Veihdeffer, Jeff Anstett, Lenny Wiley, Tom Matthews, Mark Lemay, Jacob Broughton, Eric Ethier, Rob Esliger, Dan Lavallee. Heat 2 – Eric Veihdeffer, Lenny Wiley, Jeff Anstett, Jacob Broughton, Tom Matthews, Mark Lemay, Rob Esliger, Eric Ethier, Dan Lavallee. Southern Ontario Modified Lite Racing Association Performance Manufacturing Senior Animal Division – 10 laps – Heat 1 and Heat 2 – Travis Majuery, Dylan Culp, Devon Rayment. RCM Racing Equipment Performance Manufacturing Junior 2 Division – 15 laps – Nigel Pendykoski, Chris Crowe, Trevor Evans, Hana Rothwell, Owen Kaiser, Ben Colaxecchia, Madelyn Goulding, Cohen Corbett. Superior PetroFuels Performance Manufacturing Junior Restricted Division – 15 laps – Jaedon Lawson, Colton Lane, Austin Nigh, Jacob Mamo, Davis Grocott, Logan Iliffe, Amber White, Lukas Moote. Wilder Racing Engines Performance Manufacturing Senior Fun Division – 20 laps – Eric Veihdeffer, Jeff Anstett, Tom Matthews, Lenny Wiley, Mark Lemay, Jacob Broughton, Eric Ethier, Dan Lavallee, Rob Esliger. Southern Ontario Modified Lite Racing Association Performance Manufacturing Senior Animal Division – 20 laps – Travis Majuery, Devon Rayment, Dylan Culp.